Electro wrote: Anyway, let's forget dusty plasmas and especially accretion. The latter is simply ludicrous. Yea, stars are dissipative systems in GTSM. They have stars being "powered" because they do not have them evolving. Thus, in EU there are two mutually exclusive objects just like in establishment. There's no way they can be reconciled. They are completely different worldviews. EU needs to get to the brass tacks of planet formation. I tried to help, but alas, it is no use. They have a different worldview. Not only that, but there are simple, serious objections that even laymen can ask of EU such as if the stars are electrically powered, where is the electrical generator? How does the electric current get to the star without a conductor? Outer space is mostly vacuum. Not only that, but why are they observed to cool and shrink and differentiate their interiors if they do not evolve as proposed by EU? Clearly we have found literally thousands of stars in various stages of evolution, yet EU still calls them "planets". Well, the conductor is plasma streams. Current is not free flowing in empty space. That would be like saying light is a wave. But a wave is not a thing. It's what something does! So plasma is the electrical cord. Plasma is an excellent conductor and is believed to account for 99.999% of the visible Universe. That is now accepted by Mainstream. As for the generator, it's like asking about God. I don't believe we'll ever know the answer. But when you think about it, electricity is everywhere, from the subatomic to the macro level. I know EU does not see planets as the end product of a star's life. But, it does at least agree that planets come fron within stars. It's a start. And besides, apart from the gravity driven Universe, what else could it be? We know gravity calls for ad hoc theories to make the hundred year old completely outdated assumptions work. Gravity is certainly not the main driving force of the Universe. It doesn't make any sense. It cannot account for the giant structures we see in space. Electro wrote: Well, the conductor is plasma streams. Current is not free flowing in empty space. That would be like saying light is a wave. But a wave is not a thing. It's what something does! So plasma is the electrical cord. Plasma is an excellent conductor and is believed to account for 99.999% of the visible Universe. That is now accepted by Mainstream. As for the generator, it's like asking about God. I don't believe we'll ever know the answer. But when you think about it, electricity is everywhere, from the subatomic to the macro level. If plasma streams conduct electricity, why is plasma coming out of the Sun and not into it? The solar wind only goes in one direction, away from the Sun. More "Wind"? I guess some will never learn. Cargo wrote: More "Wind"? I guess some will never learn. Cargo, if you do not believe in a plasma universe (or EU), what exactly are you doing on this forum? This is not the place for mainstream religion. Do you believe the sun is a nuclear reactor? If not, then what powers the sun? If it's a simple dissipative system, can it really sustain itself for billions or millions or even thousands of years in the cold vacuum of empty space? Surely, there would be much more coming out of the sun than coming in. Stars would not last so long. They would lose matter and shrink much faster. And in your opinion, how do stars form? From magical collapsing gas clouds? Plasma cosmology proposes the z-pinch, which can at least be demonstrated in the lab. Haven't seen a collapsing gas cloud initiating thermonuclear reactions in the lab yet. Cargo meant that 'wind' is used by mainstream scientists to describe the solar discharge, it is not a wind, it is a plasma accelerated by an electrical field. Don Scott has some excellent electrical explanations for this. Oops! If that is what Cargo meant, I apologize for the misunderstanding. Haven't had my coffee this morning... I feel pretty dumb right now. Daniel, could you please point me to these explanations from Don Scott? I have a lot of respect for the man. Okay, that is fine. A plasma accelerated by an electrical field. Though I am wondering, if the Sun is electrically powered, then why are all the charged particles moving out of the Sun and not towards it? In EU, there's no reason for electrical input to be stable for billions of years. The current density could very slowly be fading out, therefore with the stars evolving just like in GTSM. If the sun was losing mass and energy with no input ever, I seriously doubt it would take billions or even thousands of years for it to "burn" out. Even in a dissipative system, I don't believe the matter input from the environment could be sufficient enough to sustain a star for so long. I'm not questioning dissipative system theory, only the time frame that is in my opinion unrealistic. And what if currents died out suddenly? What would happen to the star? Perhaps that could be when real cooling occurs? Just saying. Evolution/cooling towards a planet could be much faster than you think, but only after cutting off the power? Electro wrote: In EU, there's no reason for electrical input to be stable for billions of years. The current density could very slowly be fading out, therefore with the stars evolving just like in GTSM. If the sun was losing mass and energy with no input ever, I seriously doubt it would take billions or even thousands of years for it to "burn" out. Even in a dissipative system, I don't believe the matter input from the environment could be sufficient enough to sustain a star for so long. I'm not questioning dissipative system theory, only the time frame that is in my opinion unrealistic. That's why I'm saying, there is no fear of it dying out suddenly. For the Sun to die out suddenly all of its mass would need to be lost as well, and the gravitational field of the star is so strong the mass can only be lost slowly. I think it takes extreme amounts of time for the star to evolve. The younger stages do happen quicker though because the rate of mass loss/energy loss is so high. It slowly down exponentially, meaning the younger the star, the faster it reaches the next stages, and the older the star the more stable and less energetic it is. Conceptually though, 1 million years is a very, very long time, yet compared to stellar evolution it is a heartbeat. So if you think about it, the young stars DO in fact suddenly die out as compared to their older companions. Think of it like this, what would tree growth look like from a rocks perspective? Trees would look like they explode out of the ground, but from our perspective they look unchanging. The same goes for stars in various stages to evolution. From our perspective they are unchanging and stable, but if you speed up time, the younger stages really ARE sudden. 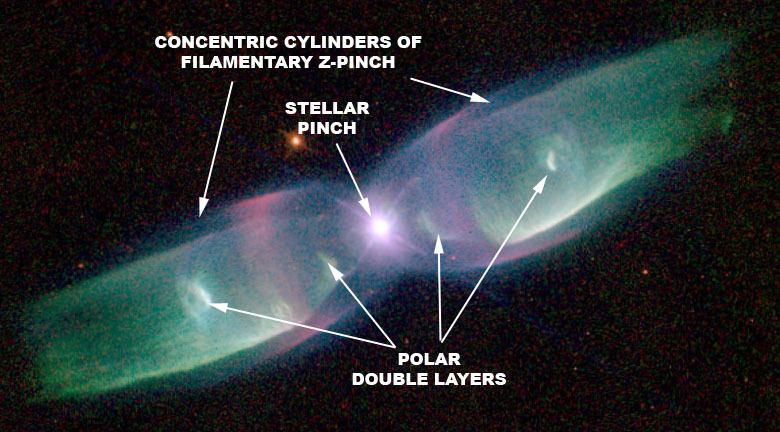 If a z-pinch was a short-lived event only seen at star birth, would we be seeing such structures for very long? Electro wrote: If a z-pinch was a short-lived event only seen at star birth, would we be seeing such structures for very long? A structure that remains stable for 100,000 years relative to how long it takes a star to evolve is short lived. Yet, from our perspective 100,000 years is an eternity. That's why I propose that the real cooling and metamorphosis of a star begins when the input current is cut off for some reason. This cooling period might take a long while as well, but not seen in stars in arc mode, like our sun. A red dwarf for instance, or a brown dwarf, could be "turned off" and well into cooling stage? I think it would be wiser to propose that there is no "input current", there is just an area where feedback mechanisms are present to allow for a cloud to heat itself up, such as a location of large scale charge separation, as is extremely similar to ball lightning and its formation mechanisms. Only the ball lightning (the star) is so large, that it has feedback mechanisms to keep it stable for extremely long periods of time. Ball lightning is so small in Earth's atmosphere that they dissipate extremely fast. So the idea of what causes its power source to be cut off is a problem that never needed to be asked to begin with, there is no input current being cut off, because the input current never existed, the star is an independent structure.